In the past it was not common that small tools, for instance add-ins to MS Excel, included any help at all. Many developers thought that their utilities were, more and less, self-explanatory. Today we have become more professional in that almost all kind of tools include help or pointers to sites where the help is available. Of course, it raises the question what help authoring tool to use to create a help system. Nowadays it exist a larger span of help authoring tools, from free to very expensive. Free or cheap tools cover the basic while the more expensive tools include more advanced features. As usual we end up in the question what needs do we actually have? In my business I mostly create help system that are either shipped with the solutions or being uploaded to a specific site. For these tasks I decided to use a help authoring tool in the middle price class and with more features that can be expected given the price level. For the last year I have been using the help authoring tool Help & Manual from EC Software Gmbh from Salzburg, Austria. From a broader point of view the tool is said to be a documentation tool and content management system for either single or multi-author editing. During the year I have collected experiences from the tools included in Help & Manual, the manuals and their support. Impict Image Editor – It’s an image enhancer software and not a genuine image tool. Print Manual Designer – A tool to create templates for manuals and PDF export. Given the content of the toolkit and its price we really get powerful tools with lot of features shipped with them. In my opinion it’s an excellent companion to have with us. It also exist a separate Premium Pack that includes 14 individual skins that can be applied on the help system with a single click. For me it takes some time before I’m used to a new tool like Help & Manual. During that time I use the available manuals, lurk around the Q&A forum and use the available support. All these resources are easy to access and easy to use. The manuals are well written. The support is also very good. I believe You will be very pleased when You decide to use it! 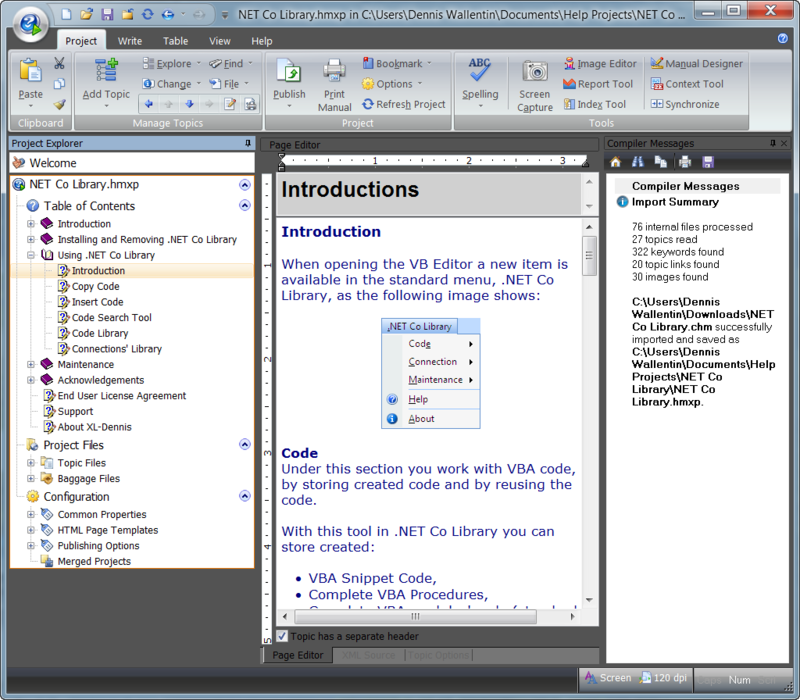 At the site Help-Info-de there are some good tutorials on how to integrate help in VBA, Classic VB and VB.NET.